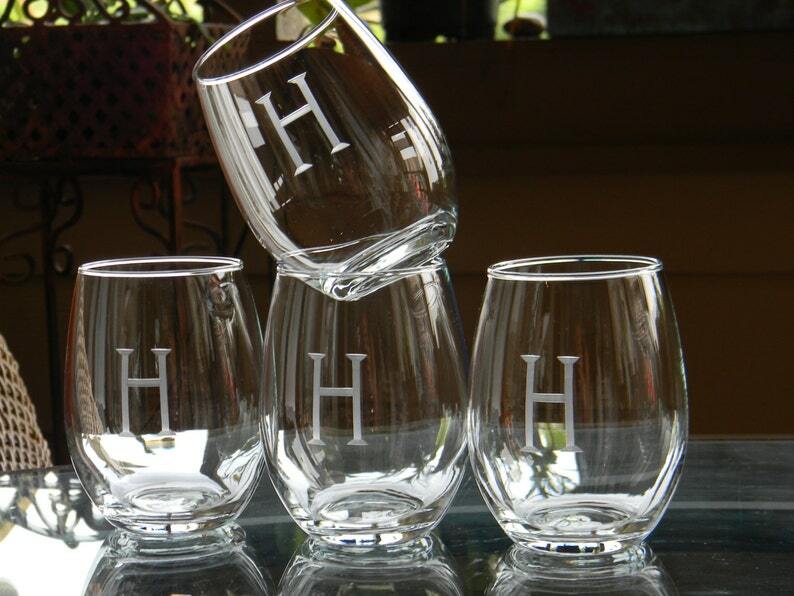 Enjoy your next vintage in these all-purpose, fun and very fashionable stemless wine glasses. I hand-engrave each glass with a custom initial. Makes a great personalized birthday, engagement, wedding or new home gift for anyone. A big hit for the wine lovers, but can also be used as an all-purpose tumbler! ►Step 5: That's it! You will receive an order confirmation email from me within 24 hours of your purchase. This is the second time I have ordered monogrammed wine glasses and they are beautiful! My son was very excited to get them! Jennifer was wonderful to work with.She was so prompt in responding to my questions. The stemless wines glasses are a Christmas present and she made sure I had them on time. They are absolutely BEAUTIFUL. I will certainly recommend and use Jennifer's company again!! !